Years ago, when I was still on Facebook, I watched a close friend, who happens to be a Buddhist priest, get dragged through the mud over one of her posts. Was it because she was critical of anyone practicing a faith different from hers? Did she claim to be smarter than everyone else? What, you might wonder, could have caused a published, well-respected, and much-adored woman of faith to be run over by such outrage? Why would so many people go out of their way to disagree with her and criticize—no, condemn—her opinion on one particular matter? This is why I think of my friend every single day. Because I watched that entire thread unfold, which was horrifying, hilarious, and fascinating all at the same time, and also because I happen to make my bed every day. Each morning, as I shake out sheets, flatten out my blanket, and fluff the pillows, my thoughts drift to my friend, and I smile. I was making my bed each day before she inadvertently lit a small social media firestorm, but after witnessing all the emotional outbursts her suggestion triggered, I thought more about why I insist on this small task each morning. What is it about making my bed each day that fulfills me? Because it isn’t merely about keeping a tidy house (although that is a big part of it), it is also about the joy of the discipline. Discipline can feel like such a hard word, can’t it? It sounds so military and stern. It can feel like a very small box with no room for outstretched arms and spontaneity. But I choose that word specifically because discipline is precisely what I am talking about. It isn’t a practice (I know how to make my bed) and it isn’t preparation (perhaps for the day); it is a choice I make every single day whether I’m in the mood or not, whether I think I have time or not. When I do it, I do it to the best of my ability. The quilt hangs evenly on both sides of the bed. The sheet doesn’t hang down onto the floor from in between the bed slats. I cannot point to my insistence on making my bed every day as the source of any great endeavor or success. If I never made my bed again, no one would actually care. Hardly anyone ever sees the bedroom I share with my husband. I can’t imagine being on my deathbed and ruminating about the impact making my bed every day had on my life. When someone says, “This won’t matter in ten years,” they are right. I agree with them. I completely understand the arguments so many people have against making one’s bed. I’ll never try to convince someone committed to not making their bed that they should because I don’t think my way is the better way or the right way. It only happens to be my way, even though there are plenty of wonderfully rational reasons for letting the sheets stay wrinkled. My rationale for making my bed every day is entirely personal. I do it because I know what I need to grab the day ahead of me with as much gusto as possible. This does not mean I won’t be able to seize the day if I don’t make my bed. As you might expect, when we have a house full of guests or an especially hectic schedule, my version of making the bed becomes a simple flip of the quilt over everything, if that. During those episodes of heightened activity, this works just fine. But when life is moving at a steadier pace, I prefer calm and I prefer order. I adhere to a series of cherished routines from morning until evening. One of them is making my bed. I have a warm bed to crawl into every night, in my own home. This is a bed I share with my husband, who I have built an extraordinary life with. Every night, my chocolate lab Tilda jumps up on this bed and settles in for the night, closer to the foot of the bed, the length of her right by my side. This closeness makes me deliriously happy. When my linens need cleaning, all I have to do is take them downstairs to our washing machine. If I need detergent, it isn’t difficult to get it. I do, in fact, whether I always initially believe this or not, have time to make my bed. Even when we have a house full of guests. If I ever need a reason to feel grateful for the aforementioned circumstances, all I need to do is open up the morning newspaper. Between stories of Central American refugees, a local kidnap victim, a Saudi Arabian woman seeking asylum, and citizens held in jail because they are unable to pay court fees, I have every reason to consider the discipline of making my bed every day as an expression of gratitude. Simply put: I am blessed to be able to sleep in a warm, cozy bed with my husband and dog by my side every single night. I do not take for granted the opportunity I have to take care of a home of my own. I find great joy in that responsibility, every single day. Not to mention, if I’m able to stick with a discipline of something like a household chore, that can be practice for other disciplines, as a writer in particular. As Charles Duhigg, author of The Power of Habit, explains, “This is the real power of habit: the insight that your habits are what you choose them to be.” I choose to make my bed everyday, which means I can choose to establish all other kinds of habits, creative or otherwise. Lately I find myself in a state of disturbed awe at how much stuff there is in the world and how easy it is to consume it. I am thinking of strip malls tucked away on busy street corners—ubiquitous in modern suburbia—multi-level shopping malls, and, you know, Amazon, where the act of purchasing anything from washcloths made of bamboo to a mirrored disco ball involves nothing more than a click and a swipe. I recently did a search for “bathroom wall sconces” on a website devoted entirely to interior lighting, and it provided more than eleven hundred options. Eleven hundred. Let’s allow that to sink in for a moment. This is one website for one basic home necessity—a light—and one particular variation of that item—a wall-mounted fixture appropriate for a bathroom. Eleven hundred choices, ranging in price from $39 to more than $1800..
My point has to do with the question of how and where all of this stuff is made, how it makes its way to my doorstep, and what steps need to be taken to ensure the latter happens without incident. And then—whether this question ends up being addressed in a month or a year or only after I die—where does all this stuff go? How much stuff can the world hold? What is the ultimate fate of all the things I will use in my lifetime? When I let my mind take a graceful swan dive down the rabbit hole of these inquiries, I end up in the exact same place every time: helplessness. I care about this planet and I believe we humans have done an abysmal job of taking care of her. When I look at the path we’re on with regard to material consumption, my outlook is bleak. I can’t see how it is possible for earth to sustain itself—and us—in the midst of all this stuff. Every time I make a purchase, whether it is a pair of socks or a car, whether online or at a store, something unavoidable happens: I create trash. I bring something into my home and some part of it immediately goes into the garbage can. (I have two trash cans in my home, and one is for recyclables. While recycling is a worthwhile endeavor, it is still something that has to be dealt with by another entity in order to, at the very least, not just end up in a landfill.) Even buying a single apple at the grocery store has me peeling off a label and tossing it. Clothes have tags, household cleaners are wrapped in plastic (and then, once I’ve emptied that plastic jug of laundry detergent, out it goes), and batteries are secured in packages that require a knife and a pair of pliers to pull apart. There are also, in most of these articles, essays, and studies, suggestions for how to shift our patterns and habits to produce less waste (or, as suggested by some, to eliminate it.) In light of all this information, which is readily available anytime I’m in the mood for some good old fashioned doom and gloom, I can’t help but wonder whether or not anything I, as an individual, do is going to make one iota of a difference. Who am I against something like—I’ll use a random but potent example—the cruise ship industry? The average cruise produces seven tons of garbage and solid waste! A capsized ship in 2007 dumped 50,000 gallons of marine diesel fuel into the ocean! I’m just one woman, and I have a husband who loves to cook, a chocolate lab, and a lot of family members that live thousands of miles away, necessitating a fair amount of air travel. I am part of the problem, and my realm of influence doesn’t extend much further than my neighborhood grocery store. Does anything I do really matter? Isn’t this the question so many of us ask ourselves these days? How can I possibly make a difference—how can I even consider I might be helping to make the world a better place—in the face of the world’s endless pursuit of more? When I feel like I’m stuck at the dark, spooky, dead end of that question, I turn it around: How can I consider not trying to help make the world a better place? Who am I not to do whatever I can to make a difference? I am an obsessive recycler—dog food cans, newspapers (yes, I read newspapers, but that’s a topic for another essay), even empty toilet paper rolls. I leave the grocery store with the week’s worth of food and supplies in my reusable bags. I even have reusable bags for produce. While I used to use paper towels to wipe up pretty much anything, I now save them for only the most wretched messes. I carry a metal straw in my purse, as well as a handkerchief, and in the summer months, my food is composted. 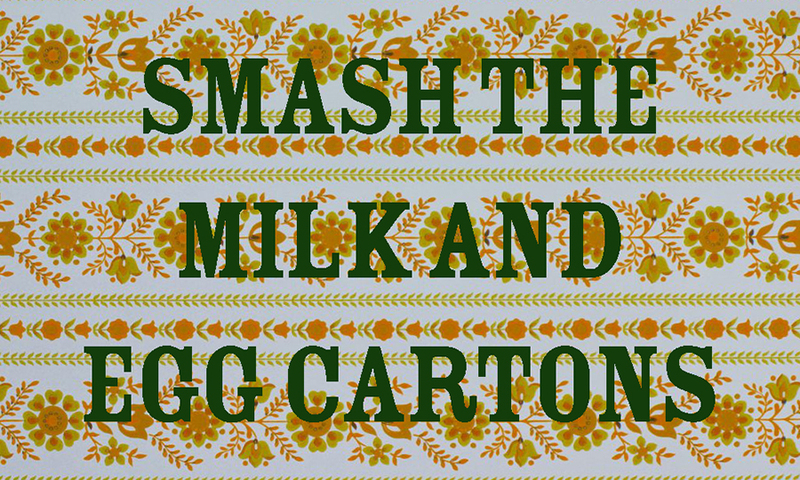 I also smash the milk and egg cartons before they go in the bins. When flattened, they take up much less space, which means I’m taking that trash (or recycling) bag out later than I would have otherwise. I see no reason to fill my garbage bags with empty space, so after the milk and eggs are consumed, I gently stomp on their containers before disposing of them. Considering these are two of the most basic items in my kitchen, I figure I’m reducing the number of garbage bags I’m filling by at least ten per year. Will these tasks and efforts on my part save the world? Not on their own. But with each cardboard box I break down and every tea bag I add to my compost, I am not only doing what I am able to do, I am also nurturing my faith in humanity. I am choosing to trust that there are others like me out there making similar efforts. They aren’t letting the water run while brushing their teeth and they’re buying organic. Some people I know take care of the planet by installing solar panels in their home. Others do it with a vegetarian diet. However this care and attention is offered, whether as a parent, a business owner, a rancher, or an artist, it matters. The feminist activist and writer Sonia Johnson said, “We must remember that one determined person can make a significant difference, and that a small group of determined people can change the course of history.” I am committed and determined to do what I can, on a daily basis, to steer the our planet in a more healthy direction. I believe there are many others who share this commitment. And while I might not know exactly who you are, I am happy to know you are out there—doing the work that needs to be done, quiet though it is, as mundane as it sometimes seems. All of these efforts, taken together as a greater whole—they matter. Every recycled box, every smashed down milk carton.